eLearning images are commonly an afterthought to course content creation. Usually the structure, text, formatting, etc., come first and only then do images come into the picture. This makes sense. Images can be time-consuming to develop, but well-planned images are a crucial part of eLearning. They have big gains for your learners when used throughout their training. Whether you’re using stock or dipping your toe into design, it’s smart to build a repertoire of image tools and resources. To make the most of the images in your eLearning content, we’ve created a comprehensive guide to using images to boost the success of your training - no matter your skill level. It helps your learners retain information. According to research, it’s more likely for our brains to memorize and recall information presented in a visual format compared to text. With complicated or sophisticated topics, you can help explain them more clearly. You don't need to write paragraph after paragraph of text to explain a concept. A well-made image can do it clearly and concisely. Images can provide a reference point for learners. They are shown a concept in action that they can relate to, and therefore are more likely to understand it. Not to be underestimated, images make your course content look visually pleasing too. An attractive course that visually stimulates your learner is more likely to result in them completing their training. 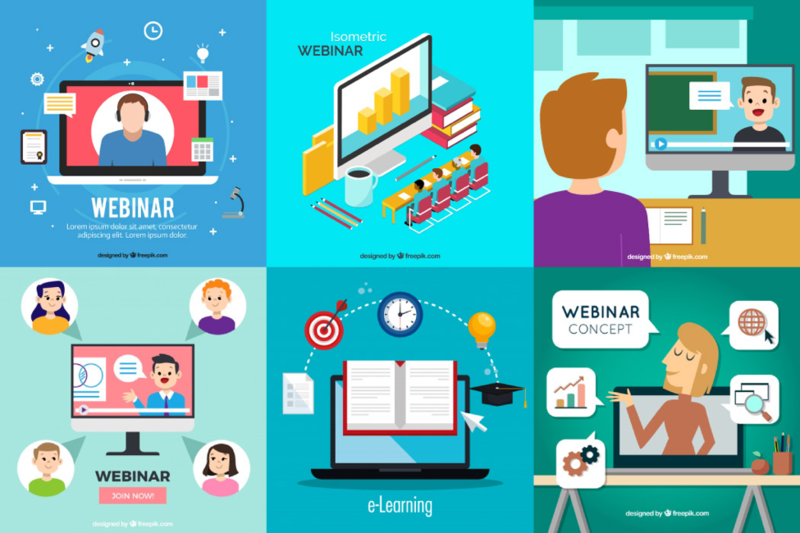 Illustrations: Similar to stock images, illustrations can be a simple yet powerful way to add visuals to your eLearning content. They can be custom made if you’ve access to a designer, or you can get pre-made vectors to use. Graphs: Diagrams, infographics, charts, are all a smart and concise way to show lots of information in one image. Whether it’s numbers, text or illustrations, this format is an effective way to make your point. Screenshots: Great for showing how to use software or do a task, screenshots are a perfect way to visually present what you want your learners to do. *Remember some are free and some are paid so check the copyright before you use these resources! A homogeneous image style throughout your eLearning content is a smart move as it sets the tone for your courses. Your message is more cohesive overall, your learners see consistency, and become familiar with how the information is being presented. This point is particularly applicable when training customers or partners. Your training content is part of how they perceive your overall brand and making it consistent strengthens their impression of it. Different audiences react to different images. And not all images are appropriate for every type of training. That’s why the images you choose should reflect the audience you're trying to engage with. For a corporate office, stock, screenshots, and charts could have the biggest impact. Whereas a less formal environment might react better to cartoon-style infographics. Creating original, visually pleasing images for your content is the desired outcome, but not everyone has the resources to do that. If you have design skills or a designer on hand - great! If not, take stock of the resources you have. We listed above the tools you can use to produce good quality graphics and images without design skills. This is a great place to start if you’ve limited resources. Although images have their advantages, when used incorrectly they can have a negative effect. They can distract, confuse and pull your learner’s attention away from what is really important in your training. Use images thoughtfully and carefully. Only add them when it enhances your content and strengthens your message to ensure they have the right impact. Similarly to the above point, badly chosen or poorly designed images can also negatively affect your training outcomes. That’s why it’s best to focus on creating and perfecting a few images that raise the quality of your content, instead of lots of mediocre ones that detract from it. Repetitiveness sparks disinterest so mix it up when it comes to your images. Add a selection of charts, graphics, banners and more to your courses. 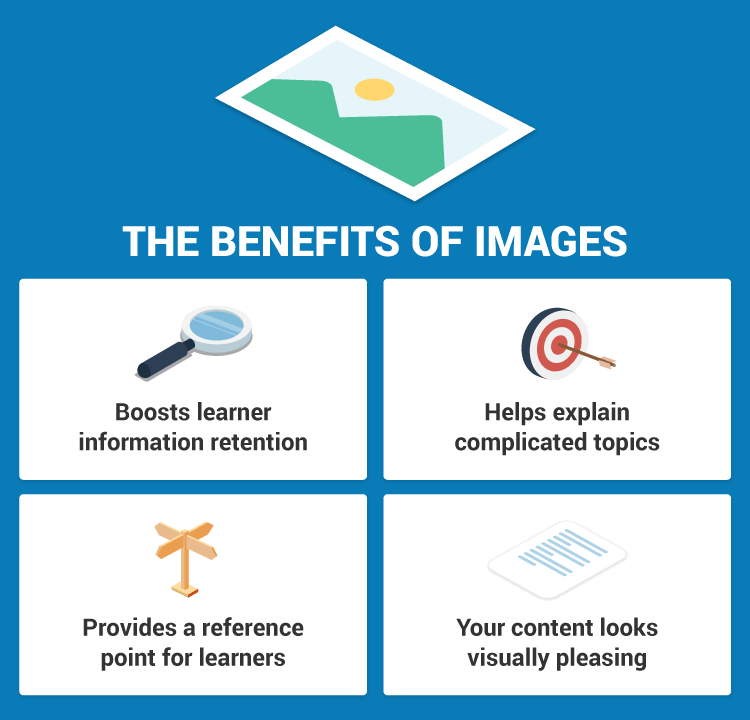 It will make your images stand out and stick in your learner’s memory for longer. The key to success in eLearning is to build a toolkit filled with resources that help you deliver the best training. And your eLearning images are no different. Find the resources that work for you and build from there to achieve training success. Did we miss out on your favorite tool? Let us know in the comments below.